Congress had earlier questioned credibility of EVMs and demanded ballot paper for 2019 Lok Sabha elections. New Delhi: As results of the Assembly elections in five states poured in Tuesday morning and the Congress made significant gains in Chhattisgarh and Rajasthan, party leaders softened their stand on allegations of tampering of electronic voting machines (EVMs). “We are in victory mode. Why should we be talking about the EVMs right now?” said former Union minister Veerappa Moily when asked whether the results allay the party’s concerns on the issue. In the past, the Congress had strongly questioned the credibility of EVMs and even demanded ballot paper for the 2019 Lok Sabha elections. On results day, its leaders were cautious. Congress MP from Silchar Sushmita Dev said that while the criticism on EVMs is not dependent on the result of an election, it will be the party high command which will take a call on the demand for ballot paper. Dev added that the result does not necessarily restore the credibility of the Election Commission of India. While Opposition parties have previously alleged that EVM tampering has benefited the BJP, Congress leaders refrained from saying so Tuesday. “We have made this allegation in the past. What has the ECI done to allay it?” Dev asked. Senior Congress leader and RS MP Renuka Chowdhury too agreed. “The results are not a referendum on the ECI either way,” she said. “We were saying that even if there is a 1 per cent possibility of EVM tampering, it needs to be looked into, and as a party accountable to the people of India, it is our duty to conserve democracy,” she added. Apart from facing heat over EVMs, the EC has also received flak over deletion of eight lakh voters’ names in Telangana. To make matters worse, the poll panel website remained hung for more than two hours on counting day. “What does that say (about the EC) now?” Dev said. 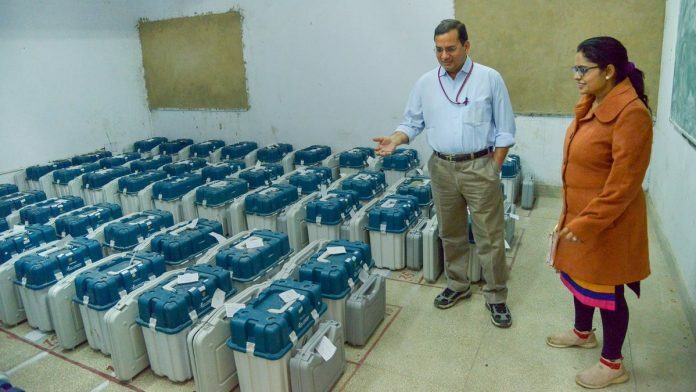 In a representation to the EC in August, the Congress had complained about “faulty and non-functional” EVMs, and questioned their credibility and fairness.